The address we chose for our blog is dontusemytoothbrush.com. Kind of long, but easy to remember and fits the way we travel. We are setting off for a 10 month journey around the world. One small back pack each and we are ready to conquer. The plan is Thailand, Cambodia, Laos, China and Tibet. After that….? Rome for Christmas. Our budget is $150 a day(excluding plane tickets). Seems doable for 4 of us. Looking forward to long bus rides and street food! 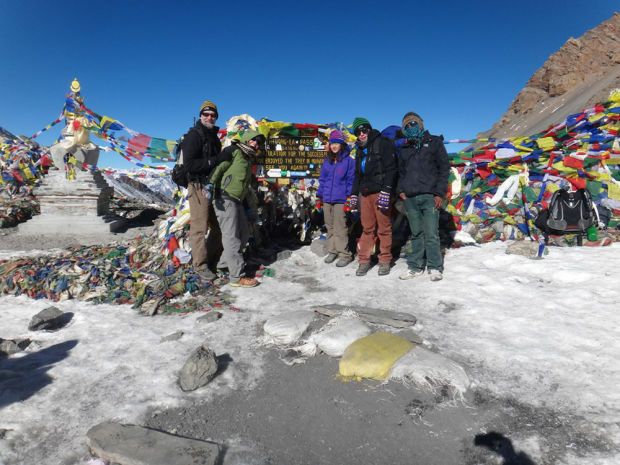 EDITOR’S NOTE: Flagstaff 12-year-old Lily Maurer is about halfway through a year spent traveling the globe with her family. She is traveling with her parents, Jeff and Kari Maurer, and her brother, Miles Maurer, 15. Lily has lived in Flagstaff from age 2. She attended Flagstaff Junior Academy and will be in eighth grade there next year. The family rented out their house and left Flagstaff in August, headed to Bangkok. They will return in June. In an email to the Daily Sun, Lily said her parents have been wanting to do this trip for a long time and saved their money. They are currently traveling around Southern Africa for four months. The family is blogging about their trip at http://www.dontusemytoothbrush.com. There was a huge festival going on in Thakhek with circus games and junk stands. We stayed at the green climbers’ home for 4 days. Did we mention one scooter crash and two burned esophagi? We now headed to Vientiane, the capital of Laos. Another city that showed the vestiges of its French colonial past. One of which was the French Embassy Clinic. A small tropical medicine clinic with Tin Tin Lao illustrations on the walls. More about the esophageal ulcerations. So, did you know that if you are taking malarial meds, don’t drink enough water and lay down afterwards, you may very well have them stick in your throat!? Well, Miles and Kari found out. They could barely swallow and it hurt even to breathe. The doctor at the clinic rolled his eyes and said in his wonderful broken English – “We see this all the time”. A week of meds and no acidic foods later, another emergency was averted. We took another long bus ride and ended up in Phnom Penh. It was a holiday for 5 days. We ended up staying there for 4. There were lots of creeper, old, white guys everywhere. They were super gross and had young pretty Cambodian girls with them. The city was dirty and smelly with piles of garbage everywhere. At the market, we all almost gagged. People just throw their trash in the street and the rain makes it all soggy. Then a garbage truck comes when the pile is high. They shovel it in the truck. We could see rats running around. There we visited the Killing Fields and the genocide museum. The places were scary and sad. Pol Pot was horribly mean and we all felt so sad when we looked at the pictures of the people before he had them killed. Dad made us walk around the entire city. On the last day the Grand Palace finally opened. There we saw the Golden, diamond crested Buddha and the Emerald Buddha too. I am tired of seeing Buddha statues, but these were very cool. I did not feel good on the next bus ride to Kompang Cham. When we went to catch the train to Cambodia we discovered the tracks were flooded. We were very happy we had not tried to get on the 5:55 am train. We took a tuk-tuk straight to the bus station and jumped on a bus that was leaving in 5 minutes. The ride was very long and after 6 ½ hours we got to the border. It was already dark and the border was going to close soon. After we got our visa we were in Cambodia. A car was going to drive us to Siem Reap that night. It was so rainy that we were scared the driver would run off the road. Finally in the pouring rain we arrived at the beautiful Golden Mango Hotel. We spent 4 days in Siem Reap. We went to visit Angkor Wat 3 times. One morning we got up early to watch the sun rise. We also went on a tour that we did not like. It went to Tonle Sap Lake and we felt like they were just trying to rip us off. It just seemed weird to stare at poor people all day. Angkor Wat is amazing and Angkor Thom is in the movie Tomb raider. Miles liked Banteay Srei. After leaving Krabi, Miles became very sick. I was off for a foot massage with Dad. Mom, feeling guilty about letting Karisa suffer through 5 days of food poisoning last time they were in Cambodia, took Miles to the nearest hospital in a Taxi. Miles was shaking and could not even walk. After the diagnosis, they checked him into the Pediatric floor. The nurses put cute PJ’s on him and laughed a lot. The next day Mom had an appointment at a skin clinic. There was a big, scabby growth on her forehead. She figured it was best to check it out now. While Miles was having porridge and pickled cabbage at the local hospital Mom and I headed off to the other side of town. Not knowing anything about the hospital she had made an appointment. When we pulled up to the clinic, we noticed that it was in the fancy part of town. There were makeup counters everywhere and it was like a mall inside. A guy who worked there was in the middle playing on an ebony grand piano, playing Bad Romance by Lady Gaga and Marry Me by Bruno Mars. It turns out that people come from all over the world to go to that hospital… It turned out that Mom’s big scab was not cancer. They said it was from the sun and she should have it cut out. They did it right then. The doctor must have felt bad that we were not fancy. He gave us a 3000 Baht (100 dollar) discount. It was hard to get a taxi to the other side of town where we were staying (about a 1 and a half hour drive). After about 5 taxi”s said no to us, we finally got one… It was a long, bumpy drive back and I got carsick. I could barely walk to our hotel room, but once I got there Miles was sitting on the bed, back from his hospital after a long night there. We left Pai and had a great river trip. Ending up in Mae Son we had to make our way back to Bangkok. Not wanting to go back to Chiang Mai, we worked our way down the border of Myanmar. This involved staying in a few small towns, as well as a 6 hour ride in a songthaew. This is basically the open bed of a truck with seats. People were on and off the entire trip. School kids hopped on and made their way to school. One women who had traveled our route for the previous 2 days with her daughter was dropped off at a refugee camp before Mae Sot. Although we had not been able to communicate with her during the trip we were all very sad as they stood out front the refugee camp with a letter in hand. While in Mae Sot we made a visit to Myanmar. Lily did not like it here. Such a change once we were across the bridge for Thailand. We had a guide who took us around and even took us to his son’s house. The house was small and on stilts in a swampy area, Garbage was everywhere . We went in and were offered coffee. Not wanting to drink the yellow, hot water Kari made excuses about how we had stomach aches. Our guide then told us his son never finished school and that was how he ended up living in Myawaddy in a dirty house with his wife and son. The guide had finished college and encouraged his son to do the same. “But some kids are just bad and don’t do what their parents say.” Lily will surely not drop out of school when seeing what the consequences are. A night bus to Bangkok and back to Feung Nakorn, a nice hotel. Jeff arrived at 12:43 am. We were all happy to see him and overloaded him with our stories. Average per day $132. Tiger Kingdom(a total waste) and Elephant Camp really jacked this up. DECISION….I hate keeping track of the costs each day. All I do is think about how much something costs and our daily expenditures. Last week I transferred our monthly budget into the travel bank account. Now I will only have to check every few weeks. The BAD news…..A line of credit payment just kicked in. If we don’t want to go in debt the budget is CUT to $110 a day. Onward we press. If we run out we will “Eat Dirt”. Pai….We are holed up in a hippie town in Northern Thailand. Thanks to Lonely Planet, which we don’t use, plenty of folks have joined us. Eating, playing video games and studying the properties of minerals is how we spend our time. It seems FUSD has set a standard that includes boring, outdated online courses. If this post seems cynical….I miss the travel days of even 10 years ago. People actually talked. Now at even given time 8 of 10 are on their phone. We are as guilty, online school and a blog. In fact, I saw the most disheartening display of this at Elephant Camp. A couple (in their 40,50’s) came to the Chai Orchid from Spain to fulfill a dream. To be married on an elephant in the water. We watched as they prepared. Flowers on the elephant, a wedding dress, local dancers. Up on the elephant they ride to the water, waving and smiling. The elephant walks 100 yards, stops for vows and then lumbers back. Cameras and phones clicking the couple returns to the lodge. Once off the elephant they Immediately head to a table, sitting across from each other. Not saying a word for 20 minutes, they text and post photos online. We took the train from Bangkok to Sukhothai, Thailand. We got a taxi to take us to our hotel and the driver took us to a more fancy hotel in the middle of nowhere, at least we finally got to the right hotel. We had a great dinner with spicy curry and fruit shakes (they were SO BIG, they were at least 1 foot tall). We had a 72 hour layover in Beijing. This is the maximum time allowed without getting a visa. We could only manage 2 nights and still get a flight to Bangkok within that time frame. We were very unprepared. Not having a printed itinerary was a problem for China. I had to E-Mail my reservation to the airline, then they printed a copy. We had booked through Airbnb. Cindy sent a driver to pick us up. They were there with a sign. That was a family first. Her house was in the old part of the city. The Communists had taken it from the family and they just got it back 10 years ago. During that time, someone had sold the entrance to several families. There were living spaces without a kitchen leading up to her traditional home. We had a bedroom to ourselves off a courtyard. Cindy gave us a cell phone to call when we were lost and arranged a driver to take us to the Great Wall. We chose to go to the Lakeside portion of the wall. There were a few locals there and us. We had the wall to ourselves. We walked for 3 hours until the wall became overgrown. Miles bushwacked for a bit before we headed back. We didn’t have to deal with vendors, entry fee or other tourists. Miles wants to return for a long walk on the wall. We ended up spending the next day at the forbidden city. . We only had to call Cindy 4 times. One night we ended up eating off a main road. Everyone seems to think that Lily can speak Chinese and asked her what we are talking about. In fact, one woman wanted to steal her at the Wall. We were confident with our subway skills at this point. We successfully took it to the airport and flew to Bangkok. Bangkok was awesome. There is reason there are so many tourists. Just taking the side streets leads to incredible Wats. Khao San Road is the best. We had a foot massage and Thai massage. We also bought some Beats for less. The tuks tuks are scary fun, we took them often. We visited the Grand Palace, Wat Pho, The Golden Mountain and several other Temples. Plus the hotel had a breakfast buffet. Yeah!!! I’m so excited for you Kari! This will be a wonderful experience for Miles and Lily. I’m really excited to follow your 10 month journey around the globe. Be safe. Thank you for the updates Lily. Kinda kept forgetting to go to your blog. So now I just started reading it I think I started backwards. I will begin over at the beginning of your trip. I am so excised to get into reading. I will get back to you afterwards. You guys are fabulous!! My sister advisable I might like this web-site. He / she once were entirely appropriate. This article truly manufactured my time. You can’t imagine the way in which a great deal time I did used due to this info! Thanks a lot! What’s up miles?!? Hope your having a good trip man. Good luck to you! Hi Lily or should I say Lollie? We’d love to have you be a guest conributor on our girls website, Go Girl Global. Girls everywhere would be interested to hear about your experience traveling the world! Let’s talk? Sounds great!! I’ll make sure to send you and email soon! My wife, my 9 year old son and I took a year off to travel the world back in 2000 and it was the best experience of our lives. Good on ya for doing this. Our son, now 23, is an amazing young man and, no doubt, the trip contributed mightily to that. One piece of advice I would offer is not to worry too too much if you have to go over budget. My only regret, and they are minor, is that I cheaped out a few times and, in the grand scheme of things, wished I hadn’t in retrospect. Of course i am referring to experiences bypassed, not creature comforts or things purchased. If you want you can check out our sons website that we put together back then, it is as it was and has not been updated since. http://www.wheresmax.com You may enjoy it. I would love to hear more about Africa as that is our next adventure. This is so cool that your family is doing this. Saw the article in the NY Times. We finished an 8 month trip with our four family members in May of 2013. We did not have the budget constraint that you decided to live with but seem to have been to many of the same areas of the world. Our blog was borderlesstravels.org if you want to check it out. Enjoy the experience of a lifetime.